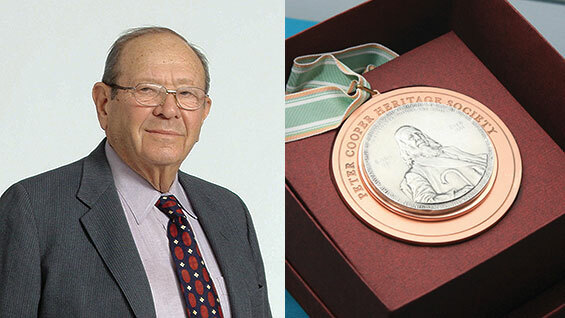 Isaac Heller and the Peter Cooper Heritage Society Medal. Photo of Isaac Heller courtesy Heller Industrial Parks, Inc.
President Bharucha surprised The Cooper Union community with the announcement of a $1 million unrestricted gift to the school's Annual Fund from Helaine and Isaac Heller (Eng'52). "This unrestricted gift represents not only philanthropic leadership, but a vote of confidence in the future of The Cooper Union," the president wrote in an email to students, faculty and alumni, offering his "deepest gratitude" to the Hellers. "When I read in the New York Times that Cooper might not be able to make it, I thought I would do the right thing," Mr. Heller said from his home in Florida. "Cooper was a great place. I sincerely feel that my years there changed my professional life." "This is what we work towards," says Jeanne Lunin, Director of Development, who got special thanks in the president's announcement. "This gift is very encouraging and extremely helpful because it's unrestricted." Derek Wittner, Vice President for Alumni Affairs and Development, notes that "Annual Fund gifts are directed toward paying educational costs for our students. They are especially important to Cooper now because they can be used immediately." Jeanne Lunin downplays her role in acquiring the gift, instead giving credit to Isaac's brother, Paul Heller (ME'53), who was instrumental in the process. "I got to know Paul and Paul encouraged me to reach out to Isaac," she says. "Knowing that Cooper was at a crucial point, Isaac was moved to help. I was hopeful we would receive a gift. We were all ecstatic when it arrived." Born in the Catskill Mountains, "Ike" Heller, 86, moved to Brooklyn when he was 12 and attended Brooklyn Technical High School. He started at the Cooper Union night school in 1943 and left a year later to join the Navy. He returned in 1946. While still a student Heller co-founded REMCO Toys in the late 1940s, which would go on to become one the biggest toy manufacturers in the post-war years, solidifying its place in Baby Boomer culture through its television commercials. Mr. Heller sold the company in 1966 and went into commercial real estate, leading a company that would eventually become Heller Industrial Parks, Inc., one of the nation's largest privately owned industrial park owner/developers. Mr. Heller has given consistently to The Cooper Union over the years, enough so that he and his wife were to have been inducted into the Abram S. Hewitt Society on Thursday for their lifetime contributions of over $250,000. But their extraordinary gift has vaulted them into the Peter Cooper Heritage Society of lifetime donors who give over $1 million. Paul Heller will be present to accept the honor.